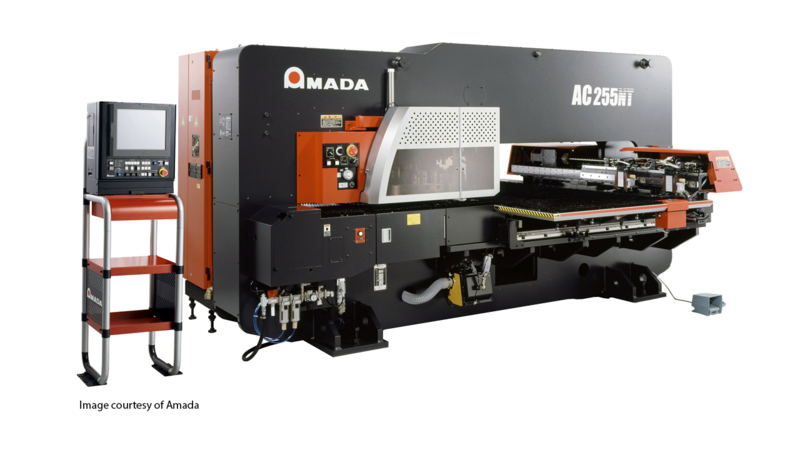 The AC series from Amada has two models available, this one and the AC-2510 NT. This punch machine has an excellent price to performance ratio. The AC-255 NT machine has great functionality to reduce costs and set up times which, in turn, increases profit with faster production speed. Sheet metal fabrication software from Merry Mechanization completely handles this machine as well as many others. The AC Series punching machines have great features that include roller table support, a brush table and a lifting brush table, sheet sensors that detect deformation in the sheet metal, air blow, a power vacuum and a punch for slug removal, tool lift, and an interface for conveyor belt control and automation, along with a 300x300mm work chute. If you want alphanumeric characters on your sheet metal parts, the AC series has a marking function that is for this specific reason and can add part marking with up to 900 strokes/min. This sheet metal CNC machine also has a slotting tool that, at any angle, provides smooth punching. There is also a tool for work chute, which lets you eject small parts using the die.